Located in the heart of the Poconos! 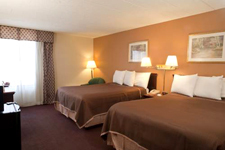 Welcome to Howard Johnson Inn- Bartonsville/Pocono Area hotel. Located off Interstate 80 and in the heart of the Poconos, our Bartonsville, PA, hotel is a perfect spot for a fun family vacation or exciting weekend getaway. Scout out area attraction from our hotel room with free wifi Internet access. When you return from your long day of golf, you can work out in our on-site gym, or relax with a swim in our tropical indoor pool. We offer 24- hour front desk service and free parking for your convenience. Non-smoking and handicapped accessible rooms are available.